When individuals find themselves cleaning house or in the unfortunate situation of liquidating estate items, it is difficult to determine a fair market price for pieces that are not currently in the mainstream market. Many people turn to online auction sites, but that information tends to be transient. And simply searching the Internet for an item often becomes a long, unproductive venture. To solve this problem, the owners of WikiValue.com created an online community for pricing used and antique items. The site is a cross between a niche social network and a constantly evolving index. 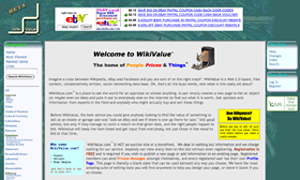 WikiValue.com allows individuals to post items for which the value is uncertain. These posts are open to comments and online discussions—and unlike an auction site, the information always remains available for anyone to view online. WikiValue.com founders chose EditMe as the platform for their online community due to its existing feature set, stability and flexible easy-to-learn development platform. A small group of entrepreneurs came together to develop and run WikiValue.com. They hoped to handle the creation and upkeep of the site themselves. In the initial planning period, they discussed the option of using an open source software package, however, they quickly realized that they would need to hire an IT staff to establish and customize any of those options. While the group had some web design and programming experience, they knew that some mistakes were bound to occur. That’s why they were particularly pleased by EditMe’s stability; the core system, like registrations, logins, security, backups, etc., are well protected—not just from hackers but from errant programming as well. And even when they did make the inevitable coding mistakes, they found that it only took a few clicks to get back to the root of the error. As a new site that is still establishing its community, WikiValue.com sees the importance in having a quick response time for correcting problems. With EditMe anybody on the WikiValue.com staff can login from any computer and get right to the task of addressing a problem. The owners of WikiValue.com were thrilled at the money they saved by having all their development needs met in-house, but as co-owner Mike Skala noted, "It's not as if we figured it all out on our own." In the beginning, the owners did have some questions as they were getting used to EditMe's API (Application Programming Interface). "The EditMe technical support staff were always prompt, thorough and thankfully quite patient," said Skala. "We had set aside some of our budget for professional services to customize our software, but so far everything has been accomplished in-house—a big money saver!" Create a website that helps users determine a fair market price for used and antique items via community collaboration. Work with a programmer-friendly wiki service that also has a helpful and professional technical support staff. EditMe’s wikis encourage collaboration. Users can create profiles, post comments, start discussions, and post pictures of used and antique items. Information is available for the public to search, enabling the website to be a constantly evolving index of information.